Morisset, Lucie K. and Luc Noppen. "Architectural History: the French Colonial Regime". The Canadian Encyclopedia, 04 March 2015, Historica Canada. https://www.thecanadianencyclopedia.ca/en/article/architectural-history-the-french-colonial-regime. Accessed 24 April 2019. Architecture under the French colonial regime was characterized less by its achievements than by its unfulfilled ambitions. 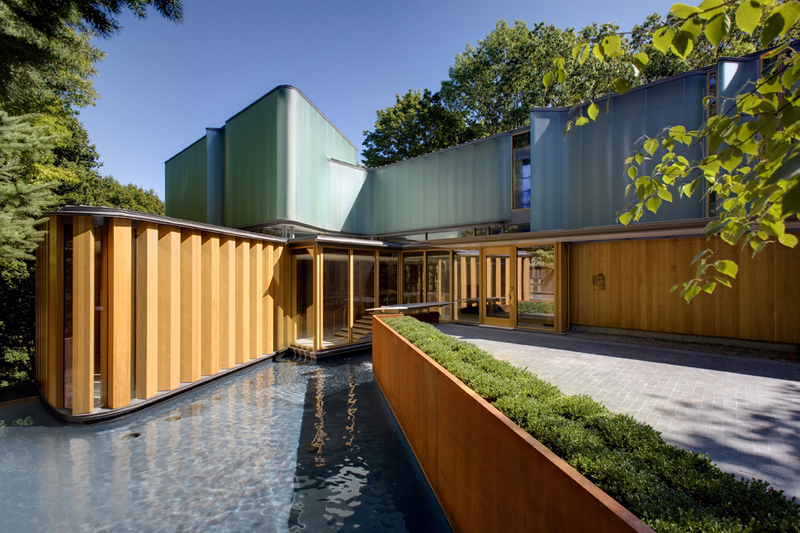 Caught between ideals nurtured in France during the classical period and the harsh climate of New France, architecture gradually came to reflect local resources. 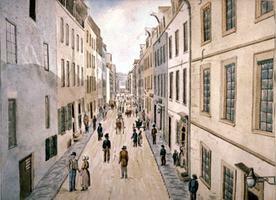 St Peter Street, watercolour, pen and ink over pencil, by James P. Cockburn (courtesy Royal Ontario Museum). 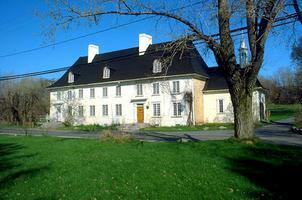 The Saint-Gabriel house, built in Montreal in 1698, in its original state (photo by Luc Noppen). On the house of Charles Aubert de la Chesnaye (National Archives of Québec, Québec City, with the notary Romain Bequet's seal, 3 May 1679). Québec City, 1647. Model by Denis Tétrault. Vault of the Sainte-Famille wing of the Ursuline monastery, c. 1710 (photo by Luc Noppen). 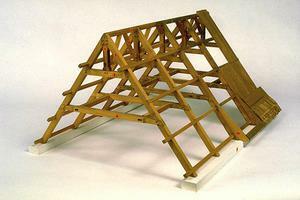 Roof frame of the Mauvide-Genest manor, Saint-Jean ( le d'Orléans), c. 1750. Model by Denis Tétrault. Roofs of the classical era (late 17th century) reconstructed on the Place Royale (photo by Luc Noppen). Examples of urban dwellings in New France (18th century) reconstructed on the Place Royale, with Notre-Dame de la Victoire to the right (photo by Marc Robitaille, Centre de production multimédia, Laval University). Circa 1735. 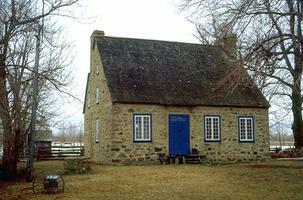 Small stone house typical of the Montreal area in the 18th century (photo by Luc Noppen). Intendant's palace. Design for reconstruction in 1727. Gaspard Chaussegros de Léry, engineer. National Archives of France, photo Holzapfel. 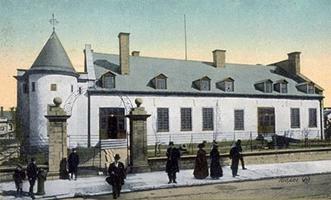 The château that Claude de Ramezay built in 1704-05 is now a historic site in Montréal (Bibliothèque nationale de Québec). 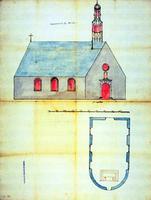 Drawing of church by Jean Maillou, ca 1715 (Archives du Séminaire de Québec). Ile d'Orléans. Sainte-Famille Church, built beginning in 1743 (photo by Luc Noppen). Québec City. The retable from the main altar of the Ursuline chapel, made by Pierre-Noël Levasseur, 1730-35 (photo by Paul Laliberté, Centre de production multimédia, Université Laval). 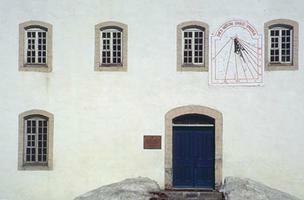 The Main House, Saint-Maurice Ironworks, erected about 1735 (photo by Luc Noppen). Built beginning in 1734 and enlarged to its present dimensions and appearance about 1750 (photo by Paul Laliberté, Centre de production multimédia, U. Laval). Ile d'Orléans. Saint-Pierre Church, built beginning in 1717 (photo by Luc Noppen). Drawing by Chaussegros de Léry, 1743. National Archives of France, photo Holzapfel. The influential Sulpician Order founded the seminary in Montréal in 1657 and served the parish church of Notre Dame (National Archives of France; photo National Archives of Canada, Ottawa). Quebec City. 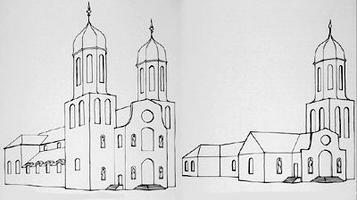 The church as it was designed in 1684 (left) and as actually built (right) in 1697 (drawings by Pierre d'Anjou). Ursuline Monastery, Québec City (courtesy Luc Noppen). Beauport, typical example of developments in rural dwelling design in the Quebec City area, 17th-18th centuries (drawings by Michel Dufresne in Beauport, de la cité ... l'arrière pays. Quebec City, 1977). The first Ursuline Convent was built in 1642. This retrospective view was painted by Joseph Légaré (courtesy Ursuline Convent). Architecture under the French colonial regime was characterized less by its achievements than by its unfulfilled ambitions. Caught between ideals nurtured in France during the classical period and the harsh climate of New France, architecture gradually came to reflect local resources. At first, the building materials and craftsmen available represented obstacles to what otherwise would have been the mere transposition of metropolitan models onto Canadian soil. Eventually, the mother country's original designs were "Canadianized" and bequeathed to later generations essentially in the form of historical memory. The Europeans who left for the New World in the 16th and 17th centuries naturally sought to transplant the legacy of their own civilization. The settlement of New France, however, differed from that of New England: having broken with the countries from which they were emigrating, the English and the Dutch chose to adapt to the lands in which they intended to dwell permanently. For people pursuing liberty, New England was a promised land. 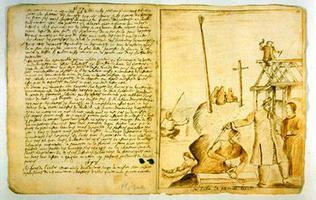 New France, on the other hand, was organized as a colony under the king's sponsorship. Imbued with the spirit of hierarchy and guided by rigid norms (including those which governed pictorial representation), the French imported models and practices to New France with no thought of adapting them to local conditions. 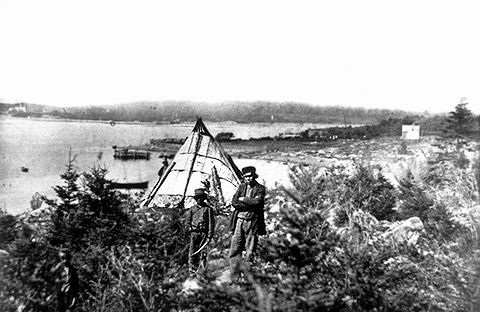 Aboriginal peoples looked on in amazement as the newcomers began construction of their settlement. While the Iroquoians were used to building with unfinished materials (tree trunks, branches, bark, etc. ), European carpenters and joiners would utilize only sawn or squared lumber, assembled by means of the mortise-and-tenon method and fixed with dowels. Architecture remained minimal in fledgling New France, at least until 1664 (two years after Louis XIV's personal reign had been proclaimed), the year the king changed the status of the colony to that of a fully recognized French province. As a result, construction of a capital city worthy of the name was undertaken on the heights of Cap-aux-Diamants. Wooden buildings made way for stone structures (previously very rare), and the harmonious forms of French classicism began to adorn the landscape of New France. From 1664, classical principles of town planning were to be employed in New France, with town design, layout and, especially, fortifications all plotted on paper before being transposed onto the ground. But in New France, the vision of the "new town" as a geometric pattern forming a grid over even-featured virgin territory came up against the enshrined medieval conception of the aristocratic town, wherein an upper (institutional) town looms above a lower (merchants') town. This latter plan upheld social tradition based on privilege and birthright. Initially the site of a project for a new town, Québec City — which Champlain named "Ludovica" — grew up around two poles. One arose on a butte (evoking the knoll medieval castles stood on) surrounded by fortified walls. These were highly symbolic, essentially defining urban space by marking off the aristocratic "bourg" (town) from the "faux bourg" (suburb — literally, the "false town") to which urban rights and privileges ("droit de cité") were only partially extended. Outside the three main towns (Québec, Montréal and Trois-Rivières), New France took shape in the form of villages linked to the linear profile of concessions along the St. Lawrence River. There, too, the built landscape gravitated around two poles: the seigneurial domain (with the manor and its mill, which villagers had to pay to use), and the parish enclosure (comprising church, rectory and cemetery), a magnet for dignitaries, artisans and merchants. Not until 1664, when Louis XIV decided that the settlement of the new province was to be effected chiefly within urban clusters, did the first genuine new towns appear (Charlesbourg, Bourg-la-Reine, Bourg-Royal, Boucherville). Subsequently, a chequerboard city plan was drawn up for Montréal (1671), and street patterns in Québec City were regularized to fit in with the surrounding fortified walls being erected by the "king's engineers," who were orchestrating urban development at the time. These engineers — career soldiers versed in the art of fortification and in the conventions of draftsmanship — breathed new life into the landscape of New France when, beginning at the end of the 17th century, they were sent over to supervise the construction of royal buildings (the Château Saint-Louis, the Intendant's Palace, army barracks, etc.) and military fortifications. Schooled in the precepts of Vauban, the famous French engineer, they provided for the colony's defences by planning forts all along its access routes. 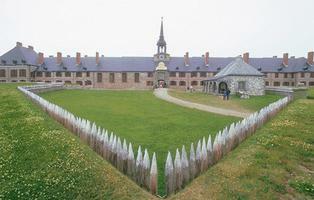 First were Fort Chambly and Fort Senneville. After the Treaty of Utrecht was concluded (1713), they established a ring of strongholds on the borders of New France — the shores of Lake Champlain (Fort Carillon, Fort Saint-Frédéric), the Great Lakes (Fort Duquesne, Fort Niagara, Fort Frontenac), and on Cape Breton Island (Louisbourg). Due to the absence of royal architects or even commercial architects, the king's engineers collaborated with the Church and religious communities on their ambitious building projects; on occasion, they even worked on domestic projects. One of these engineers, Gaspard-Joseph Chaussegros de Léry (1682–1756), a skilled draftsman, expert in the formulas of classicism and blessed with creativity, was the first to successfully adapt the lofty aims of metropolitan France to conditions prevailing in the colony. Building sites in New France — ruled by the know-how of craftsmen rather than by the art of architects — were often forced to skimp on or abandon classical metropolitan form. The first builders were ship's carpenters and other artisans with only a rudimentary knowledge of the builder's art. After 1664, workers were trained in the classical tradition and were likely familiar with a treatise on stonecutting, carpentering or woodworking, but they arrived with little building experience. Because French tradition favoured the most durable of materials, the stonemasons supervised construction, passing on their instructions to carpenters, woodworkers and roofers. Apprentice masons, masons, master masons and stonecutters, especially if they were competent draftsmen, became by default the first "architects" in New France. "Architects" were those craftsmen whose original solutions — the only ones drawn up on paper — once built, could serve as models for other buildings. The scarcity of labour and materials was a constant in the architecture of New France. Not only were costs exorbitant, which led to abandoned projects, but construction techniques were ill-adapted to the harsh climate, leaving buildings vulnerable. Heating requirements meant a higher incidence of fire loss and alternate freezing and thawing weakened masonry in foundations and walls. In such conditions, practicality prevailed, countering the trend toward uniformity in the built landscape that characterized the 18th century. The first structures in 17th-century New France were wooden, usually half-timbered (colombage style), with a framework of square beams, sawn lengthwise. The half-timbering was sometimes "rocked in" — completed by a filler mixture consisting of stones and mortar. On the inside, partitions between rooms were assembled with boards or small wooden planks; roofs were also made of boards or, more simply, of thatch. 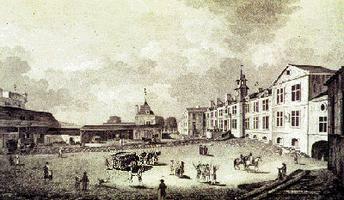 From these simple beginnings, the metropolitan vision began to take shape in 1664. While half-timbered construction would remain predominant, the regional norms which presided over the architectural landscape gradually gave way to precepts found in Parisian treatises and models. What they proposed was a set of easily recognizable characteristics eloquently proclaiming the colony's enhanced status. Monumental architecture in the metropolis had an early impact on the cityscape of the new provincial capital: the Château Saint-Louis (1647, 1692), the Church and College of the Jesuits (1666, 1725), the Cathedral of Québec City (1684) and the Episcopal Palace (1692) imposingly embodied the principles of French classicism, which religious communities and orders adopted in their turn. In Québec City, Montréal and Trois-Rivières monumental structures were built whose scale and formal expression, seemingly at odds with the vast uncleared tracts around them, left an imprint on the built landscape as a whole. Classicism — flourishing in France when New France was founded — refers to the Greco-Roman heritage that flourished in the architecture of the Italian Renaissance (15th century). Its architectural language was based on a system of proportions ("the orders") and on a particular vocabulary (e.g., columns, capitals, pediments). Classicism in France went through phases associated with successive reigns (Henry IV style, Louis XIII style). The colonial variant of classicism, while it preserved the classical ideal as expressed in regular, sharply defined shapes, was less ostentatious than that of the mother country. Because they did not have enough stonecutters at their disposal, colonial project foremen had to make do with rough-quarried dark limestone. In order to protect both lesser-quality stone and the thick mortar joints of the masonry, but also to simulate the lighter colour of fine-cut stone, the walls were whitewashed. Only the frames (jambs and lintels) of openings (doors, windows and hearths) were assembled out of cut stone that was chiselled smooth or "combed." 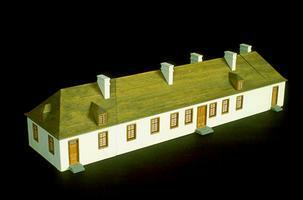 The development of traditional building practice in New France led to the appearance of substitute materials, attesting to the adaptations demanded by the colonial context. To imitate stone walls, half-timbered houses were stuccoed; wood surfaces were even textured to resemble masonry. An essential characteristic of classical French architecture was the vault, which freed the building from the ground and protected it from fire. 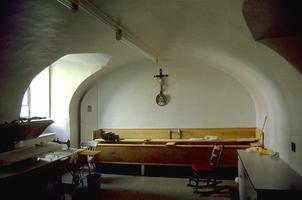 In well-to-do homes, vaults helped form the cellar (to which, in palaces and convents, a kitchen was added). In New France, the vault was assembled on a wooden arch with either quarried or rubble stones placed on a bed of mortar. Metropolitan models showcased stonecutter virtuosity, favouring the flattest possible vaults, some of which were fit together without mortar. The handiwork of immigrant craftsmen in 17th-century New France was unsurpassed. By the middle of the 18th century, a loss of rigour in their art was already evident — vaults had become barrel-shaped with exaggerated arches rising close to the ground. 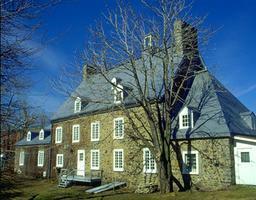 The technique of the "great roof beam" — the key to a framework designed to support stone (slate) roof tiles — was brought to New France by craftsmen. The trusses of the roof beams, as well as the rooftop struts linking them, were made of pieces fashioned off-site which could be readily assembled (by mortise and tenon) to specifications. The type of assembly — chosen in response to local conditions — is a distinguishing feature of this building technique in New France. The great roof beam of the 17th century adopted the proportions of the full truss; seen in profile, the roof is equilateral, meaning that the height of the rooftop is determined by the depth of the building. In the 18th century, when twinned central building units made their appearance, significantly increasing depth, the isosceles triangle had to be adopted — the height of the roof was equivalent to half the depth of the structure. Not as high, these new roofs also carried less beam weight, since the trusses could be spaced out through the introduction of purlins; they were also equipped with attached ladders so that they could be more easily scaled in case of fire. Following the norms of French classicism, which included the roof as an integral part of the design, architects introduced the broken or mansard roof (after Mansart), exaggerating roof height on structures with greater depth. They also used "keel" and "imperial" roofs atop staircase and latrine turrets. Although slate was the preferred roofing material, it was in short supply. 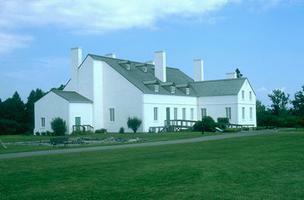 The overlapping boards temporarily used on unfinished roofs dotting the landscape were replaced by increasingly popular substitutes, such as the blackened cedar shingle and the "Canadian-style" sheet-metal covering, in an attempt to evoke the slate tiles in staggered rows that adorn roofs in France. Windows in the world of French classicism are genuine "cross-hatches," wooden structures in which the intersection of crosspieces and a right-hand mullion suggest the form of a cross. The main crosspiece divides the window into four sections: two casements and two panes, all of them mobile. In urban areas, windows were insulated with wooden indoor shutters and heavy curtains; then, the first storm windows began to appear as protection against the cold climate. Doors were blind (windowless), fashioned from pre-cut panels. In the 17th century, the outside doors of important buildings were in two sections, the wider one mobile; in the 18th century, there was only one. Also in the 18th century, interior doors latticed with glass panes became more widespread. By the beginning of the 18th century, the vocabulary of classicism, as expressed by craftsmen, had been grafted onto the stock of local methods and prevailing conditions in the colony. Craftsmen were led away from classicism by a series of intendants' ordinances — adopted after major fires in Québec City (1682) and Montréal (1721) — which prohibited the use of wainscotting and other flammable wooden embellishments. The ordinance drawn up by Chaussegros de Léry and put into effect by intendant Claude-Thomas Dupuy in 1727 is explicit: dwellings had to be of stone, and erected on vaulted cellars; fireplaces and chimneys were to be set in outside walls; chimney stacks had to be installed in a single, solid wall of masonry, to facilitate access; gabled walls and right-angled interior walls had to emerge on the roof, to serve as firebreaks; garreted roofs with occupied wooden storeys were banned, to be replaced by unoccupied attics sloping on both sides; the heavy "great roof beams" gave way to lighter beams or trusses that could be dismantled quickly. All woodwork — casings, porches, stairway turrets — was forbidden on outside walls. Taken as a whole, these provisions amounted to an early form of city planning, the first true regulation of construction known in Canada. Despite its detailed nature, the ordinance had little chance of being understood by craftsmen who were often functionally illiterate and whose training and apprenticeship preceded the new code. Thus, the transformation of classical monumental French architecture into the earliest "Canadian" architecture came about by means of several major building projects that paved the way for the changeover. One such project was the rebuilding of the intendant's palace, destroyed by the 1726 fire that had inspired the ordinance. 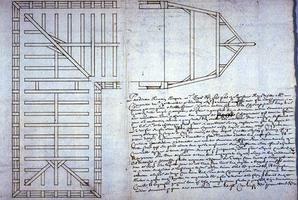 Chaussegros de Léry drew up reconstruction plans incorporating all the specifications called for by the new regulation. Disseminated, understood and reproduced by craftsmen, then disseminated afresh, this prototype became the norm: the urban dwelling in New France represented an enshrined architectural style with which "Canadians" could identify. The ordinance and resulting prototype also provided the foundation for colonial norms in decorative expression. Project foremen had a tendency to take certain liberties with classical architectural patterns whose use had been reserved for the noble orders (in churches, palaces and private mansions). 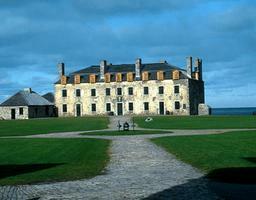 The architecture arising largely in the absence of such orders began to dominate the domestic landscape of New France. Due to the ban on embellishments, particularly wooden ones, dwelling size provided the sole mark of social distinction to citizens prosperous enough to acquire larger building lots. Even though stone houses — costlier than half-timbered ones — were still the exception to the rule, the appearance of substitute methods and materials which made it possible to imitate the preferred model confirmed the acceptance of a new architectural style in the urban dwelling of New France. In rural areas, where domestic architecture evolved more slowly, chiefly because it was unregulated, stone construction was rare; wood was the dominant building material in the villages and countryside under the French colonial regime. On the Île d'Orléans in 1743, for instance, there were only three stone constructions. Only in the second half of the 18th century, when there was a significant demographic upturn in rural areas, did masonry work begin to be used for enlarging wooden houses. In the Québec area, the laterally added square living space accounted for the typical shallow elongated shape of stone houses. Because the populating of the Montréal region came later, and less land was available, simpler, smaller houses were more common there. 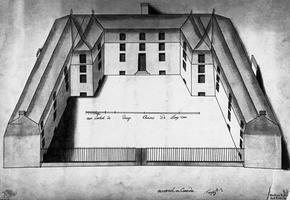 The architecture of rural dwellings was limited to a basic form that grew out of urban models: the Château of Saint-Louis de Montmagny lent its profile to several houses along the Beaupré coast, as well as to the Manor of Niverville (1729) in Trois-Rivières; similarly, the memory of the Château Saint-Louis, rebuilt by Frontenac in 1692, survived in the accomplished lines of Mauvide-Genest Manor (1750), in Saint-Jean on the Île d'Orléans. In 17th-century New France, the level of comfort was modest by today's standards. 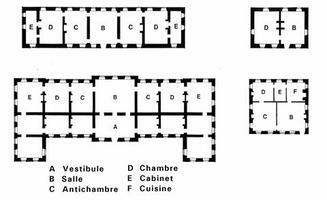 Construction of single, instead of double, main building units — the usual practice in metropolitan France — was predominant in New France at the outset; rooms were shallow and called "traversing" rooms because they opened both to the front and rear. A prosperous-looking house was one stretching out lengthwise, expansible only in the opposite direction — sometimes in the shape of a château, sometimes in that of a palace. 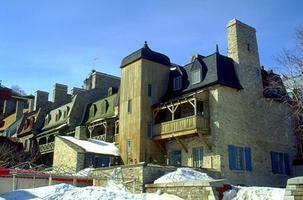 A building in "château" style was formed by four main building units around an inner courtyard. Monasteries and convents adopted this style at the beginning of the 16th century, since it symbolized the life of seclusion while allowing free access from one main building unit to another around the inner cloister. 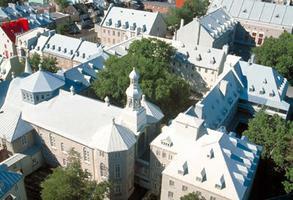 In Québec City, the Ursuline Monastery, the Augustine Hospital Monastery, the College of the Jesuits and that of the Récollets, together with Monsignor Laval's seminary complex, were all château-type buildings. Conceived and partially realized in the early 17th century, their archaic form distinguished them from later "palace"-type buildings. Less self-contained than the "château," the "palace"-type building was well-adapted to the urban environment: parallel to the street, the principal building unit rose up at the back of the main courtyard, which was framed by two other "fore-central" (avant-corps) building units. Appearing in France at the beginning of the 17th century, the palace and its diminutive form, the private mansion, rapidly outdistanced the château because they made party walls possible. In Montréal, the Messrs Saint-Sulpice, scions of the nobility, were the first in Québec (1685) to utilize palace-type construction for their seminary. 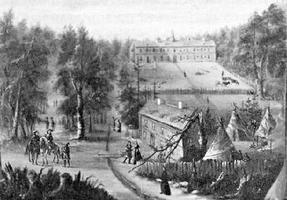 In Québec City, Monsignor de Saint-Vallier, a prince of the Church of noble blood, built a veritable private mansion (hôtel particulier) to serve as the episcopal palace, which came to be known as the Bishop's Mansion (l'hôtel de Mgr l'Évêque). Single main building units contained one or more sets of lodgings, or "apartments," which consisted of at least three interconnecting rooms in a row (main room, antechamber and bedchamber). More opulent apartments might include several antechambers, with the bedchamber flanked by workrooms and walk-in closets — tiny windowless rooms where servants and children also slept. In rural areas, the art of habitation had improved little on the medieval heritage; in the combination "chamber-bedchamber," the living area was distinguished from the sleeping area only by a hearth, which was used for both heating and cooking. Since the climate of New France made an unheated bedchamber impossible, the poorest people had to content themselves with a single room, whereas a genuine chamber-bedchamber, equipped with two hearths, suggested a measure of luxury (even though beds, called "cabins," could generally be seen in both areas of the house). The only feature distinguishing chamber from bedchamber in such dwellings was access to the outside, front and back, which was only from the chamber. Some old houses, with front and back doors in the same half of the building, still bear witness to this arrangement. Living conditions were high-density; in rural areas, as early as the end of the 17th century, several generations of a family would occupy the same chamber-bedchamber area of a house, while in an urban setting, bourgeois custom dictated a subdivision of the house into several chamber-bedchamber units, occupied by servant families or tenants. In other words, imposing bourgeois houses, several storeys high, were veritable apartment blocks where proprietor, employees, servants and tenants shared the same hallways, staircases, latrines and kitchen in non-hierarchical traffic patterns that meant everyone had to go through each other's rooms to get to their own. At the beginning of the 18th century in Québec, the French introduced the double, or twinned, main building unit, a deeper structure wherein rooms opening onto the front ("main-courtyard side") were separated by a right-angle inside wall from rooms opening onto the rear ("garden side"). At this time, the "palace"-type building outstripped the "château" type in popularity because the main building unit could be readily doubled in size. The first structure attesting to this new "art of habitation" was the intendant's palace designed by the engineer La Guer Morville in 1713: around a vast public room occupying the centre, in which the Sovereign Council deliberated, were arrayed the intendant's apartment, on the north, and that of his wife, mirroring it, on the south. This reflected the convention under which spouses of noble rank lived in separate quarters; because the episcopal palace and the Château Saint-Louis de Frontenac were designed for unmarried men (Frontenac's wife never lived in New France), the structures remained only half-finished. While multi-family dwellings and high-density occupation remained the order of the day throughout the French colonial period (single-family houses came in only under the English), the doubling of main building units did have a significant impact on domestic architecture and the built landscape. Beginning in 1720, the majority of urban dwellings had a deeper structure, containing two rows of adjoining rooms, which facilitated the conversion of combination chamber-bedchambers into roomier apartment units. Kitchens appeared next to chambers; around the bedchamber were antechambers, workrooms and walk-in closets. 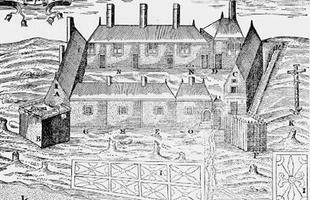 Many structures were rebuilt along these lines, with doubled central areas: the Château de Ramezay in Montréal (1756), the Main House of the Saint-Maurice Ironworks (1737) and Boucherville Manor, following the Conquest. In the palaces and private mansions of New France, the furniture was of good quality, but monotonous. For artisans and the middle class in the 17th century, furniture was scarce, limited to trunks, stools, sleeping mats and one bed per household. The typology grew more diversified in the 18th century with the enlargement of indoor living space; but instead of the kind of hand-carved pieces by cabinetmakers and custom-furniture makers which could be found in metropolitan France, wardrobes, chairs, tables and other items were assembled by craftsmen specializing in household furnishings made with panels and mouldings. A local tradition of custom-furniture making had not yet taken root. Hence, furniture from the French colonial period is rare, especially furniture imported from France, which returned to France with its owners in the aftermath of the Conquest. What is called "traditional" furniture originated, for the most part, in the second half of the 18th and beginning of the 19th centuries, when improved economic conditions and a more highly developed "art of habitation" offered Canadians the chance to live in more comfortable houses. The presence of the Church, first justified by its missionary activity, was affirmed in European-run institutions by an ambitious building program. 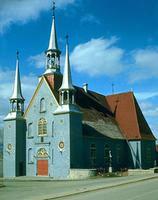 The Jesuits were first, undertaking in 1647 the construction of Notre-Dame-de-la-Paix Church in Québec City. A simple stone structure, the church was in the form of a Latin cross, with the semicircular apse facing east, as required by Christian tradition, with lateral chapels on the transept and the pinnacle at the cross-point, in accordance with metropolitan practice. After 1664, religious architecture experienced a powerful surge in the number and quality of structures in the immense new diocese entrusted to the first bishop, François de Laval. He promoted the construction of huge churches in the burgeoning towns and more modest ones (although built of stone) in the first rural parishes organized under his aegis. In 40 years, a number of major religious buildings were constructed in Québec City and Montréal, often subject to the vagaries typical of projects during the French colonial regime. In 1666, the Jesuits, who had been evicted from the parish of Notre-Dame, erected a new church adjoining and in front of their college. The design, in the form of the Latin cross, with two stairway turrets on the façade and a slate-tiled, saddle-like roof, was typical of Jesuit architecture in Europe. Stung by the affront, the bishop ordered the rebuilding of the small church dating from 1647, so that proper episcopal dignity would be conferred on it (the diocese had been organized in 1674), and architect Claude Baillif was given a mandate to erect a huge cathedral whose façade would be capped by two high towers. The building project, started in 1684, underwent numerous interruptions and the church remained unfinished. The commission for the episcopal palace was also given to Baillif by Monsignor de Saint-Vallier, but the structure was likewise left uncompleted. The projected building was only half built and the chapel, which was to have formed its centre, thus remained an external structure, admired for architectural qualities such as the façade in fine-cut stone cadenced by pilasters and composite capitals, and the keel-shaped roof. Other churches which embodied French principles of religious architecture included the Saint-Antoine Récollet Church, erected in Québec City beginning in 1693, and Montréal's Notre-Dame Basilica (begun 1672 and completed in 1683), reminiscent of the Sulpician church in Paris. These now-vanished monumental churches introduced to North America the norms of classical religious architecture of 17th-century France. They served as models, inspiring more modest imitations that borrowed from the prototypes only what suited the socio-economic context of New France. In rural areas, the first churches reproduced the extremely simple features of Notre-Dame-de-la-Paix; later, under the pressure of demographics, they could be enlarged on the model of the cathedral. This model became the norm for rural parishes at the beginning of the 18th century — the nave was extended and the bell tower was displaced toward the front pediment. The churches in Cap-de-la-Madeleine (1715) and Saint-Pierre, Île d'Orléans (1717), are the oldest examples of this style. Other urban models were imitated throughout Québec. The Récollet churches of Québec City and Montréal became the models for many other churches, owing to their large naves and simple floor plans, which were easy to construct. 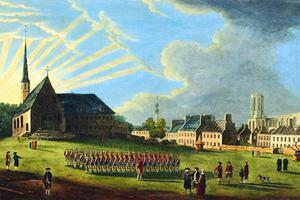 The churches in Saint-Jean (1732) and Saint-François (1734) on the Île d'Orléans, as well as that of Sault-aux-Récollet (1749) on the Island of Montréal, illustrate this influence. Likewise, the appearance and dimensions of Church of the Sainte-Famille on the Île d'Orléans, built beginning in 1743, evoke the memory of the Jesuit church in Québec City. Monsignor de Saint-Vallier's chapel also served as a model, chiefly because Jean Maillou adapted the plan for a rural church he was commissioned to build. With its semicircular apse inscribed in the line of the nave walls, Saint-Étienne Church in Beaumont (1726) exemplifies this simple pattern, which was dominant throughout the 18th century. The sober exteriors of these models stand in sharp contrast to the dazzling interiors — richly carved and brilliantly set off with gilt and polychrome — that were created by sculptors, woodcarvers and embellishers. Embellishments in wrought iron, plaster and wood were popular in the 17th century. Noël Levasseur (1680–1740) and Jacques Leblond, known as Latour (1671–1715), established a solid tradition of architectural sculpture (primarily in churches) — a tradition which would flourish throughout the 18th and 19th centuries — by using imported works such as the baldaquin in the former chapel of the episcopal palace and the main altar of Kamouraska's Sainte-Hélène Church as models. The most eloquent testimony to this art is the Ursuline Chapel retable begun in 1730 by Pierre-Noël Levasseur (1690–1770) and his workshop. Church construction in New France, limited by a scarcity of materials and lack of money, often proceeded in phases. Chaussegros de Léry first proposed this approach as a solution suited to the colonial context. The first phase called for erection of the basic structure (masonry and roof framework), with finish work and embellishment to be delayed until the parish had the necessary means. This strategy made ongoing construction possible, even if building projects were limited to the essential features, bereft of all embellishment. After 1760, when the Conquest precipitated the departure of the French elites, the Canadians born in New France, many of them well-established, stayed behind. These craftsmen, trained by those who had come from France, were the sole bearers of the know-how and aesthetic ideals imported from France and adapted to Canadian circumstances during the French colonial regime. The massive destruction caused by the Seven Years’ War left a need for builders, especially woodworkers, since stone structures had survived the conflagration. This was a boon for craftsmen. For instance, master carpenter Jean Baillairgé (1726–1805) (see Baillargé Family), who had acquired a knowledge of draftsmanship, was to rise through the ranks to become the architect of Québec City's reconstruction. Few traces of New France have survived; burned down, destroyed, rebuilt and modernized through the centuries, the legacy of the French colonial regime is more archival than actual. In the streets, we find little more than the end product of a long process of reduction, adaptation and Canadianization, evoking the memory of ancestral endeavour before 1760. See also Religious Building, Architectural History: Early First Nations; Architectural History: 1759–1867; Architectural History: 1867–1914; Architectural History: 1914–1967; Architectural History: 1967–1997. M. Archibald, By Federal Design (1983); E. Arthur, Iron: The Story of Cast and Wrought Iron in Canada from the Seventeenth Century to the Present (1982); M. Brosseau, Gothic Revival in Canadian Architecture (1980); C. Cameron and M. Trépanier, Vieux-Québec: Son architecture intérieure (1986); C. Cameron and J. Wright, Second Empire Style in Canadian Architecture (1980) and Canadian Architect and Builder, 1–22 (1888–1908); Brian Carter, ed., The Architecture of A.J. Diamond (1996); M. Carter, ed., Early Canadian Court Houses (1983); R. Cawker and W. Bernstein, Building with Words: Canadian Architects on Architecture (1981); N. Clerk, Palladian Style in Canadian Architecture (1984); Kelly Crossman, Architecture in Transition: From Art to Practice, 1885–1906 (1987); A. Duffus et al., Thy Dwellings Fair: Churches of Nova Scotia 1750–1830 (1982); C.M. Ede, Canadian Architecture 1960/70 (1971); F. Gagnon-Pratte, L'Architecture et la nature à Québec au dix-neuvième siècle: Les villas (1980); A. Gowans, Building Canada (1966) and Church Architecture in New France (1955); R. Greenhill, K. Macpherson, and D. Richardson, Ontario Towns (1974); H.D. Kalman, Exploring Ottawa (1983) and A History of Canadian Architecture (1994) and The Railway Hotels and the Development of the Château Style in Canada (1968); M. Lessard and H. Marquis, Encyclopédie de la maison Québecoise (1972); M. MacRae and A. Adamson, The Ancestral Roof: Domestic Architecture of Upper Canada (1963) and Cornerstones of Order: Courthouses and Town Halls of Ontario 1784–1914 (1983) and Hallowed Walls: Church Architecture in Upper Canada (1975); L. Maitland, Neoclassical Architecture in Canada (1984); Leslie Maitland, Jacqueline Hucker, and Shannon Ricketts, A Guide to Canadian Architectural Styles (1992); J.C. Marsan, Montreal in Evolution (1981); Lucie K. Morisset and Luc Noppen, Québec, de roc et de pierre: La capitale en architecture (1998); Newfoundland Historic Trust, A Gift of Heritage: Selections from the Architectural Heritage of St. John's, Newfoundland (1975) and Ten Historic Towns: Heritage Architecture of Newfoundland (1978); Glenn McArthur and Annie Szamosi, William Thomas Architect, 1799–1860 (1996); L. Noppen, Les Églises du Québec (1600–1850) (1977); L. Noppen, C. Paulette, and M. Tremblay, Québec: Trois siècles d'architecture (1979); J.I. Rempel, Building with Wood and Other Aspects of Nineteenth-Century Building in Central Canada (1980); A.J.H. Richardson et al., Quebec City: Architects, Artisans and Builders (1984); T. Ritchie, Canada Builds 1867–1967 (1967); I.L. Rogers, Charlottetown: The Life in its Buildings (1983); M. Segger and D. Franklin, Victoria: A Primer for Regional History in Architecture (1979); Geoffrey Simmins, ed., Documents in Canadian Architecture (1992); Society for Study of Architecture in Canada, Selected Papers from the Society of Architecture in Canada (1976–84); D. Stewart and I.E. Wilson, Heritage Kingston (1973); J. Veillette and G. White, Early Indian Village Churches (1977); J. Wright, Architecture of the Picturesque in Canada (1984).